Jean-Auguste-Dominique Ingres, Napoleon on his Imperial Throne, 1806, Musée de l'Armée, Paris. This painting, one of the best-known representations of Emperor Napoleon I, was Ingres’ second portrait of Napoleon Bonaparte. The promising young student of David, Jean-Auguste-Dominique Ingres (1780-1867), was one of several artists to receive an official commission to portray Napoleon dressed in one of the many different Coronation robes that the Emperor wore during the “Sacre” at Notre Dame de Paris in December 1804, and the portrait here is a decidedly more symbolic and formulaic depiction than the earlier portrait he had executed of the First Consul. It is not known exactly who commissioned the work.One hypothesis, by Sébastien Allard, suggests that the commission came from an Italian institution because in the top right-hand corner there stands a shield with the arms of the Papal states surmounted with the crown of Italy, see the catalogue of the exhibition “Portraits Publics, Portraits Privés”, Paris, Galeries Nationales du Grand Palais, 2006-2007, n.8 However, the Corps Législatif bought the painting on 26 August 1806 and destined it for the reception room of the President of the Assemblée. In this way, it would confront the Emperor on his arrival for the annual session. Everything in the painting expresses – iconographically – the legitimacy of this new kind of ruler, the Emperor, as defined by the first article of the Senatus-Consulte of 18 May 1804. The laurel crown (a symbol of rule and indeed victory) and the colour purple which, in Roman times, was reserved for Imperial use, recall the Emperor Augustus, founder of the Roman Empire. Napoleon also carries regalia redolent of a remote Carolingian past: the sceptre “of Charlemagne”, said to have belonged to the Holy Roman Emperor, which is itself crowned by a miniature statue (possibly of Charlemagne) whose pose is echoed by Napoleon’s. In his left hand, Napoleon holds the rod of justice, and at his side, he carries a sword whose design was inspired by Charlemagne’s legendary blade, “Joyeuse”. 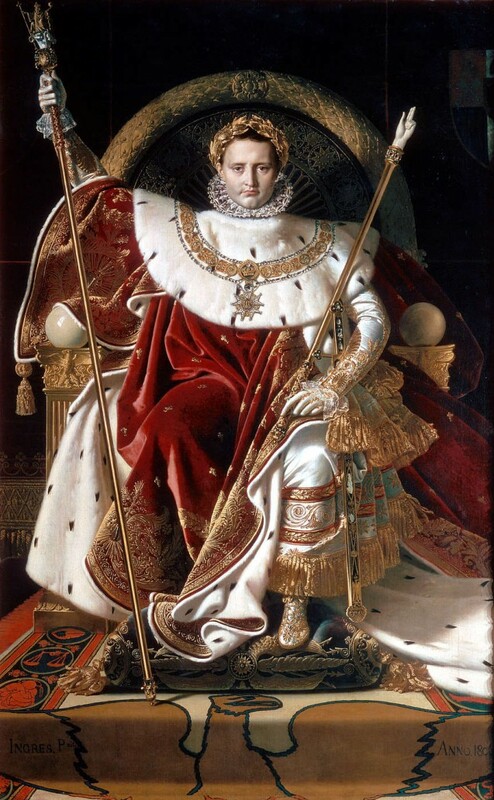 The immense throne and the ermine robes are decorated with bees (symbol of the Empire and reminiscent of Childeric’s cicada’s), and round his neck Napoleon sports the imposing necklace of the Légion d’Honneur (order established two years earlier by First Consul Bonaparte). A striking and unmissable effect of the geometry of the latter elements around Napoleon’s head is the extraordinary halo-like effect. This compositional strategy, combined with a pictorial space represented with almost no depth, is highly reminiscent of Jan van Eyck’s(circa 1390–1441) depiction of the enthroned “God the Father” in the central panel of his Ghent Altarpiece which was visible at the Musée Napoléon (now the Louvre) when Ingres painted this portrait. Thus, Ingres’ Napoleon can be read as a figure with quasi-divine power. Indeed, he is seated in position similar to that of the Greek god Zeus in a well-known representation made by the sculptor Phidias in 435 B.C. (long-since destroyed but which survived in Roman copies and on coins) – with one arm raised and the other at rest – a position used later by Ingres, in his 1811 painting of the Roman god Jupiter. The whole painting is rendered with meticulous attention to the luxurious materials, revealing Ingres’ admiration for Renaissance artists such as Raphael.Ingres even included a drawing of Raphael’s “Madonna della sedia” as part of the decorative details in the carpet here in homage to the earlier artist. The painting did not however meet with the approval of the public when presented at the Salon in 1806. More importantly, it did not please Jean François Léonor Mérimée, the man whose task it was to determine whether the finished work was suitable for the Emperor.“Dans ces dispositions j’ai été voir le tableau de M. Ingre [sic]. J’y ai remarqué des beautés de premier ordre, mais malheureusement de l’ordre de celles qui ne sont appréciées que par les artistes et je ne pense pas que ce tableau puisse avoir aucun succès à la cour. Autant que je puis me rappeler les traits de l’Empereur, que je n’ai pas vu depuis trois ans, le portrait de Mr Ingre ne ressemble aucunement […]. C’est pourtant une belle idée d’avoir dans sa composition évité tout ce qui pouvait rappeler les portraits de nos Souverains modernes mais cette idée a été portée trop loin. L’auteur en adoptant le type des Images de Charlemagne a voulu imiter jusqu’au style de cette époque de l’art. Quelques artistes qui admirent le style simple et grand de nos premiers peintres le loueront d’avoir osé faire un tableau du 14ème siècle : les gens du monde le trouveront gothique et barbare” Whilst admiring the technical skill of the painter, and approving that Ingres had not chosen to represent the Emperor in the manner of previous monarchs, Mérimée felt that these stylistic references to the art of the past went too far, calling the work “gothic and barbarous”, and he felt that the portrait would not please at the Court. Moreover the Emperor’s face was found not to resemble him sufficiently. The painting was therefore not given to the Emperor but was to remain in the collection of the Corps Législatif from 1806 to 1814, whereafter it was added to the collection of the Royal Museums. In 1832, King Louis Philippe gave it to the Hôtel des Invalides, where it remains today. Ingres went on to have a career which would span the two Empires. 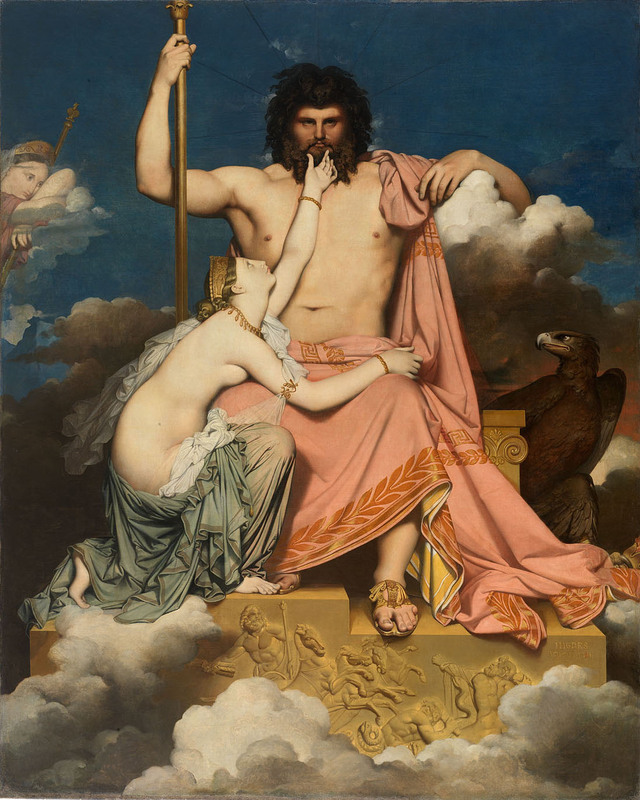 In 1811, he was commissioned to paint “Le Songe d’Ossian” for the ceiling of Napoleon’s bedroom at the Palais Quirinal. He also realised several portraits and medium-scale works for the Murats in Naples. Indeed, it was undoubtedly for his portraits and for his nudes (including the Turkish bath which was owned by the Prince Napoleon, Plon Plon) that Ingres was most highly esteemed in his life and is best remembered.